Today I thought I'd show you the stuff I've finally gotten to help my eye looks to be way better. Trust that I will be proving that to you in the next few posts. So worth the money. And if I really someday do YouTube, I've got the stuff to do so. What do you guys think of that? Would you sign up to watch me do makeup tutorials for "mature" women and real life? I of course am no expert, just someone who loves makeup and feels that the twenty somethings shouldn't corner the YouTube market. So I went on vacation right? Came back all rested etc. Not thrilled to go back to work, but who is? The very day I returned to work, I get called into the principal's office. This is my way of saying the boss's office. I asked her-am I in trouble? She said no, but still had to go into her office. It seems the one coworker who I thought was on my side went to the boss while I was on vacation to complain that sometimes I can be a b*tch. Well duh. How long have I been working there with her? Since 2009? And you're just figuring this out now? The messed up thing is that she came to me before I went out as an adult and we talked it out, I apologized for hurting her feelings and we hugged it out. As far as I knew, we were good. So imagine my chagrin when I'm told that she told the boss about this. I told my boss that I thought we had worked this out already and didn't know why she was bringing it up to her now. My boss knows I tell it like it is and appreciates me for that. You bet I was pissed. I didn't talk to her for a good week. She knew I was pissed at her, tried to get me to talk to her, but I was way too pissed to be civil. I decided to wait it out until I could talk calmly and maturely. It took a good week as my period got in the way. I finally said something to her this past Friday. She claims the boss came to our office to introduce the new person they hired (the new Stupid-but needs a different name-more on that in another post). She says she was just venting and that it was on my boss for choosing to call me into her office on the day of my return. Way to put if off on another person. What she and the others don't know is I'm like the mole. Even though I keep to myself and do my work, I'm always listening and watching. My boss wanted to know how things were going in the office since all the new changes happened that I told you about. Like the huge pile of work I showed you. I'm the one that tells it like it is and the boss uses me for the truth in what goes on in my office. Anywho, let's see what goodies I've got now. 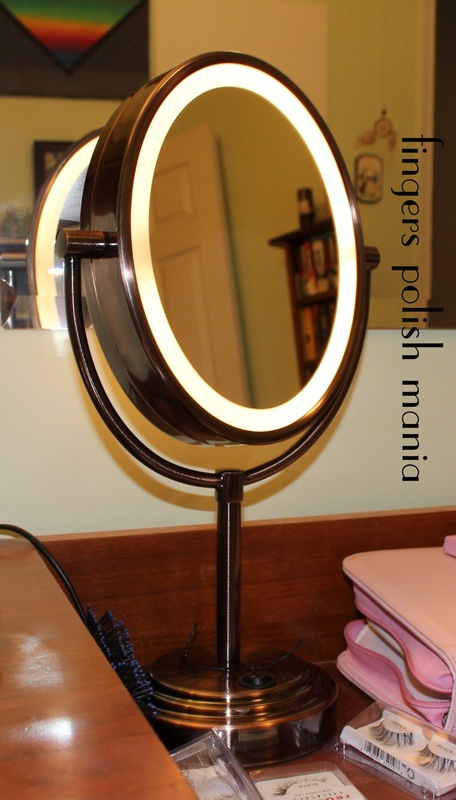 This is a lighted mirror that has normal magnification on one side and huge magnification on the other. It ain't pretty when I look at my face magnified-but it helps me see to put my lashes on, to see stray brow hairs etc. This will also be the mirror I use if I do YouTube. 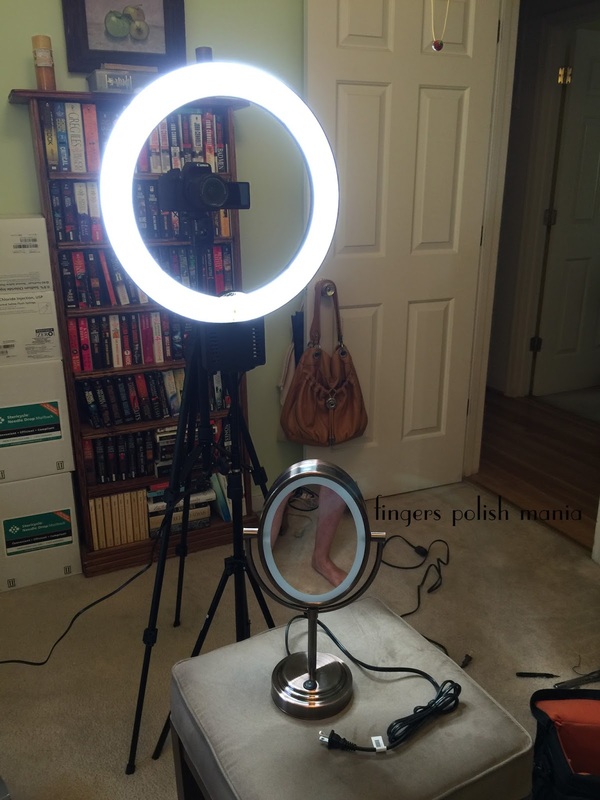 This is the ring light I got. Had to get the stand separately. This is NOT a Diva Ring. That was too much money. You can see I've got my camera on a tripod and the ring light on a tripod. Bummer is this is the lowest the ring light stand goes. So when I take my picture I have to sort of squat funny. And yes that is my foot in the mirror! I'm having to learn how to take eye pictures with this set up. Before I was using my iphone and a macro lens. I've also figured out that my right eye is better for photos than my left eye. Even though for me, I'm better at doing my left eye. I will prove that in the next few posts as well. Oh and yes that light is freakin bright as hell. What do you think? If you're interested, I got all these things on Amazon.com.